The expression “cultures urbaines” (“urban culture”) gathers cultural, artistic and sport customs from the streets, whether it is dance, music, sport, street art… but it is also a way of life. It all started in the 80’s with hip-hop music. Inspired by the US, the Eastern neighborhood of Paris quickly became a key location for urban culture. Through urban density, collective accommodations mix with social diversity. We can see in Seine-Saint-Denis numerous cultural and sport customs in public spaces claiming their origins. Thanks to the hip-hop movement, urban culture praises positive values such as sharing, respect and mixing. Inspired by New York City where hip-hop is an answer to violence in the ghettos, it is an artistic but also an ideological movement. Furthermore, urban culture is also a question of resisting, sharing and collective creation. There is a strong link with the public space: streets are claimed to be an inspiration but also a place for artists to express. Streets are accessible for everybody: there are no borders with the audience; it is the most visible scene! Dancers, skaters, graffiti artists, they all started in the streets. Yet, it created tensions between the municipality and the inhabitants. Streets are represented as a field for permanent negotiations. First essentially attracting a male audience, more and more women started to take part in urban cultures, such as Vinie Graffiti and Kashink. Graffiti, Rap music, poetry slam, human beatbox, urban dances… disciplines are rich and varied. Here are examples of what type of art you can find in Seine-Saint-Denis. Street art is a predominant culture in the cities of Seine-Saint-Denis. Mural paintings, street artists and paint sprays are countless. 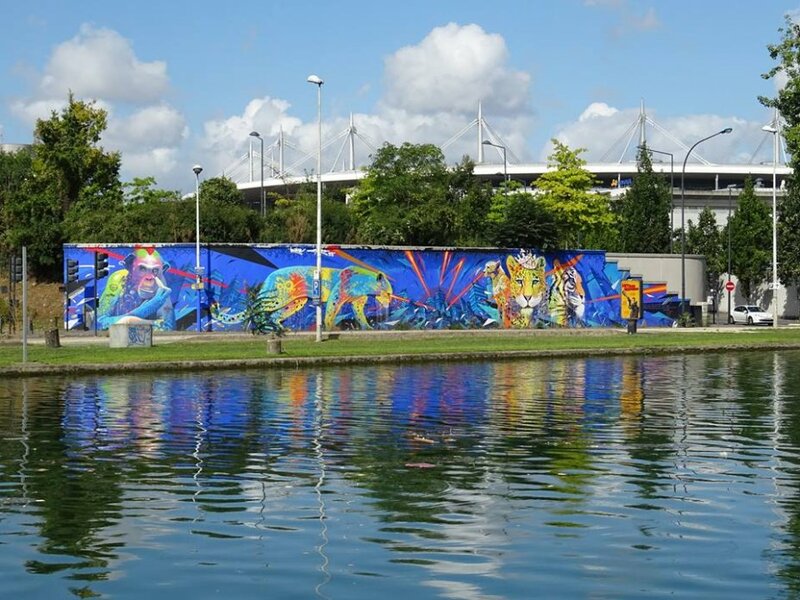 Some cities as Bagnolet, Montreuil, Saint-Ouen and some neighborhoods such as Canal de l’Ourcq or Oberkampf – Ménilmontant became must-see location for street art lovers. Read here the article dedicated to street art to discover more about this culture. Numerous street art festivals are organized every year to celebrate street art. When street art has been recognized part of contemporary art a few years ago, art galleries started to display street art works, such as Lacroix or Wallworks galleries in Eastern Paris. Seine-Saint-Denis is considered to be the birthplace of hip-hop in France and focus on this movement permanently evolving: rap music, break dance, beatboxing, urban dances and stand up dances… hip-hop is part of the territory. International festivals offer all year long dancing, music, battles and open mic spectacles: Terres Hip Hop, Canal 93, Hip Hop Tanz, H2O… Discover the list of all the festivals and their program. Some sports were born in the street and are practiced on improvised fields, in the streets and use urban furniture. Nevertheless, more and more locations are dedicated to street workout such as skate parks or some public facilities. These demonstration sports (sometimes freestyle demonstration) consist in doing acrobatic figures with skateboard, rollerblades or BMX. Even street workout mixes gymnastic and body building. Clothing is an important part of urban culture. Urban artists collaborate with street wear brands to create caps, sneakers, sweats, customized t-shirt, etc… You will find street wear booths at Malik Market at the Paris – Saint-Ouen flea market. Numerous cultural places are also dedicated to urban culture in Paris and around. They represent hip-hop culture and offer a quality program to the inhabitants and the audience. WIP Villette is an artist residence promoting urban culture at the Parc de La Villette. In Bobigny, the mythic venue called Canal 93 is a well-known place for musicians. In Montreuil, Café de la Pêche welcomes new talents of rap music for memorable open mics. Opened in 2013 in Aubervilliers, Embarcadère always offers a very good program. Café Culturel à Saint-Denis (La Fabrik) or concert halls such as Glazart, Mains d’oeuvres and Cabaret Sauvage are also important locations welcoming artists from the urban music. The Juste Debout school, located in the 20th arrondissement of Paris, focusses on “stand up dance”. The Moov’n Aktion association also takes part in the urban culture of Seine-Saint-Denis.